On the catwalk above bubbling cauldrons of extra-strength acid, the musical arch-criminal, Don Felder, dragged himself forward. He had been bound in irons along with the rest of the monstrous sleazeballs once known as the Eagles (except for that guy who wrote the instrumental that got used as the "Hitchhiker's Guide to the Galaxy" theme, which got him a pass), along with every surviving member of other criminal groups such as Starcastle, America, Styx, and the Grateful Dead. He wore only filthy, stained, torn boxers, and his entire body was smeared in mashed dung beetles and a thin layer of soft, rotting banana goo, all the better to entice the ten-throated warb gorbler, which would soon devour him, roll him around in its stomach acids for several hours while keeping him alive, and then spit him back out again. After that, he would be thrown into a cauldron of acid to be dissolved slowly and painfully. But since his monstrous crimes against music itself warranted more than one execution, he would then be resurrected through the use of highly advanced alien medical nanotechnology so that he could be executed again and again. "I admit my crimes", cried the poor, damned arch-idiot, crumpling to the disgusting, dung-covered floor. "I am a complete and utter moron and my music is vile filth!" he admitted. "Not good enough!" cried the assembled crowd of WFMU listeners. "You SUUUUUUUUUUCK! Into the ten-throated warb gorbler you go!" "Mmmm, tastes like chicken", said the ten-throated warb gorbler. "Now, where's Dennis DeYoung?" Holy mamas. Another week of Garbage Time. GOOD MORNING FELLOW DUMPSTER DIVERS!!!! matt + clay = new show? Great pre-garbage segment. That plus Fred Neil is helping lift my spirits. Nothing like starting the day with some tasty garbage! @iKE....THNAKS FOR THAT!!!! it has coloured my day! ahhhh shanandoah has me weeping. The dog is looking at me funny for laughing at the computer. Thanks Ike. For some reason "I've got a secret" made me think of Secret deodorant. @Ike-the Dead blended Bluegrass, Jazz, Blues and rock music. Also, Styx truly rocks un-ironically. They are totally un-self consciously pretentious and I love them for it. @WN, I can respect that. I was mostly just needling Dead fans a bit there (esp. Jeff C. on Sunday nights, whose show is otherwise amazing). I like many of the instrumental bits in their songs, I just don't dig that ding-dong Jerry Garcia's droopy, whiny, goofy vocals. They're wildly overrated, but not really *bad*. And Styx isn't that awful either -- I should've picked a better proxy for "70s rot that Mr. Cheerful would play if he was turned loose instead of being chained to an enforced playlist." And also, the name "Dennis DeYoung" is just funny to end on. "this was HORRIBLE! It sounded like a bunch of instruments being run through a shredder. AWFUL! I want a nice 3 or 4 minute long version of the one I heard in the newest film...the banjo sound in that one was so beautiful! It sounded like angels descending from heaven...this GARBAGE sounds more like a bunch of monkeys were given instruments." Hey Matt! You know, while walking around in the rain yesterday I found 60% of a $20 bill. You know what that means? I can write a letter to the Bureau of Engraving and Printing, return the money and then they send me $20. So how are those app investments doing, fine sir! Breakfast report: Just-picked, scandalously fresh raspberries over homemade granola with whole yogurt. Cold, black coffee. It is spelled Cap'n and did you ever notice the Cap'ns eyebrows are on the outside of his hat? The playlist of the future...today! @Jake If you have at least 51% of a bill, you can exchange it as legal tender. There is no such thing as too much echo. ah yes, King Vitamin. good times! the power of the donut compels you. Have Breakfast with THE KING! @ngh: so your brain is fully activated by now? @NGH: Yes! That is exactly what I said! @Fred-I took C programming in school-one exercise was "write a program to find primes". THAT was not easy! I am not really sure how it is done to this day! I don't WANT to have a long verbal conversation with my ex wife and her new boyfriend about my son. Email is fine for that. @Weil Neil: I don't know either. I usually ask to a talented math wizard, but he was on vacation. So I went with "I don't know, but I can prove the max is 37"
You're thinking of Cyrillic, Matthew. "Дуб = Oak" literally just means Oak = Oak, and it's the same for the album title. Дуб is pronounced "dib" and yes, it means "oak." Для is pronounced "dla" or "dlya". @Fred-I actually toyed with the idea of simply GETTING A LIST of all primes and comparing the number to it, but I thought that would be cheating. I FORGET how I did it, but i did try to google the answer a lot back in 2000 back before the internet had as much information. let's exploit Matt's 'dumbness' !! Oh wait, it's more like "doob" than "dib". Sorry, my Russian is super rusty. Holy cow, Spiral Jetty, haven't thought about them for quite a while. Morning Matt! A fine show today, as always! Mr. Rogers never did it so well. matt needs a little shy garbage tiger. @Fred-I have heard purists like C, whereas C++ offers some useful add-ons. Thoughts? Do you use EMACS to compile? Say, has domain name wfmu.felder been registered yet? Milk thistle is supposed to be good for your liver. I like milk thistle with my sisal. Milk thistle keeps your garbage clean. milk thistle is actually tasty, but it's a lot of potentially painful effort for a very little food. At the Erie County Fair the donut grilled cheese is a thing. That's in NY state. Also I had to favorite the Felder....again. And I think Ken got to the playlist title. i was going to let the felder play through today, but i couldn't get past 1 minute. crud. i missed the beginning of heavy metal. can you play it again? I'm still concerned that if this woman is ridng something without proper safety equipment and it explodes that she may be hurt. Does Don Felder know what he's doing? Oh yes, The Spacious Mind. Is he licensed in any way? i think it's clear that don felder absolutely does not know what he's doing... or he absolutely does. true. you either put your faith in him and go with it or you don't. takin' a ride is more than a state of mind. It's a way of life. For some reason, my iPhone crashed at 11:03, did I miss anything good? Nah, @fred, I merely got pulled into a meeting just before 11:00. Perfect timing! Brian if you missed "the drifter", off the REALITY BLIPCROTCH album, then yes. otherwise, no. If I'm listening when it comes on, I go to GTDS stream as soon as Felder starts. Sometimes I come back. Sometimes I don't. @crateslinger, some potential DJ is really missing out on a big four-minute audience every Tuesday at from 11 to 11:04 by not having a live show on the Drummer Stream then! GTDS is pretty much always listenable and Tony Coulter does a great show starting at noon. The rest of the day is pretty good too. I get the feeling Don Felder is not universally liked. Friends, I have to say, from the bottom of my gullet, you are the best fellow Resistance members that a freedom fighter could hope for. I may not make it there with you, but I see it in the distance! I can SEE IT! That SHINING CITY ON A HILL where there is NO DON FELDER! It gleams! I know, in my head, that it's lifetimes away, but I reach out and... I feel in my heart that I can almost TOUCH it! where was all this freeform flow when you were w/ Clay? it's coming, of course, but i plan to be dead before enduring that. Ken's PR campaign has taken it's toll Matt. You need some damage control. No Matt, it's time to play an ENTIRE 3 HOUR SHOW OF NOTHING BUT FELDER / HEAVY METAL! It's weird, something does seem to happen to the volume at about 11 down here. Usually corrects itself in about five minutes. Perhaps an hour about the good works Don Felder has done for poor children or something like this. back in the day, we used to call flip flops thongs. The Resistance has *always* been here. You, sir, are being disingenuous. Away with flip flops. AND people who walk noisily with them! Don Feder's Heavy Metal is the "Eternal Flame" of our generation....show some respect!!! when i was little flipflops were plastic (rubber?) and thongs were leather. Did you know, for instance, that despite the lyrics to this song Don Felder is a well known activist for women's machinery safety? Play Felder, stick it to, the still dead, Glen Frey! @fred LOL LOL... but you got his name wrong, it's Brain In New Orleans. I guess he or she must be a disembodied brain in a jar, maybe with some delicious Cajun seasonings. Thought I should stop back in momentarily to apologize for being bitchy... I better check myself; guess I'm in a mood today. Something good came from Felder - self awareness! Matt, you're still my favorite millenial and I love your show, but I can't listen to that song anymore. I'm sorry. @Brianin: sorry about that, I've been mangling names all day, what's wrong with me? regarding Ike @11.28 i'm thinking along the lines of the Jim Price show, but on the drummer stream from 11am-11.05 on tuesdays. could be called "forgoing a ride". hard to imagine someone being less than perfectly polite on the internet but here we are. Here we are. 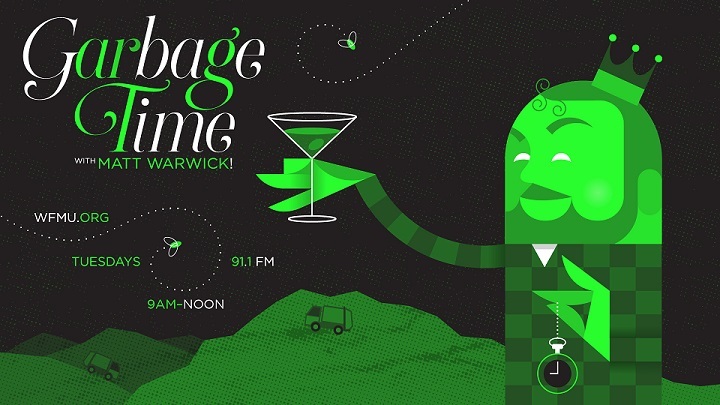 Play that funky garbage, Warwick! Hi not " brain" Brian...lol.. Even though people think I'm "Wicked Smaht" being from Boston....great show as usual..
Disclaimer: Lafayette Afro Rock Band is NOT garbage. It's damn fine music. i heard this a lot by Charlie Rich when i was little. i prefer the Al Green version.